Every final decision made by the Disciplinary Tribunal may be appealed to the Court of Arbitration for Sport (CAS). 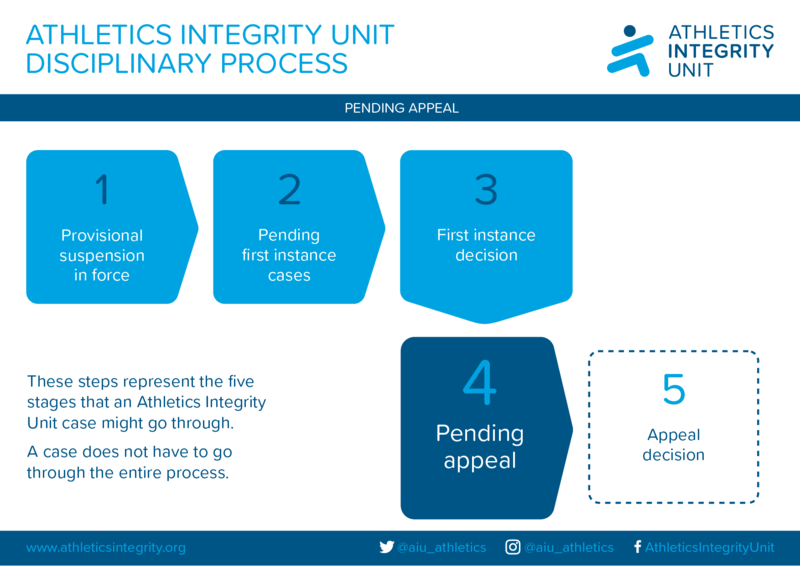 The Court of Arbitration for Sport (CAS) is the final disciplinary instance for cases arising under the IAAF Anti-Doping Rules and the IAAF Integrity Code of Conduct. This section of the site lists the appeals that are currently pending before CAS. The list includes any appeals against a decision of the Disciplinary Tribunal as well as any appeals against national decisions or decisions of CAS sitting as a first instance tribunal that arose before the Disciplinary Tribunal commenced its operations. The cases in this list will also appear on the list of First Instance Decisions. Cases will be removed from this list once an Appeal Decision has been rendered.